YAY!!!! How exciting! Can't wait to be introduced! A Tuxie ? A Tuxie ???? SO HAPPY! This made my day! I actually said "oh my gosh oh my gosh oh my gosh" aloud. 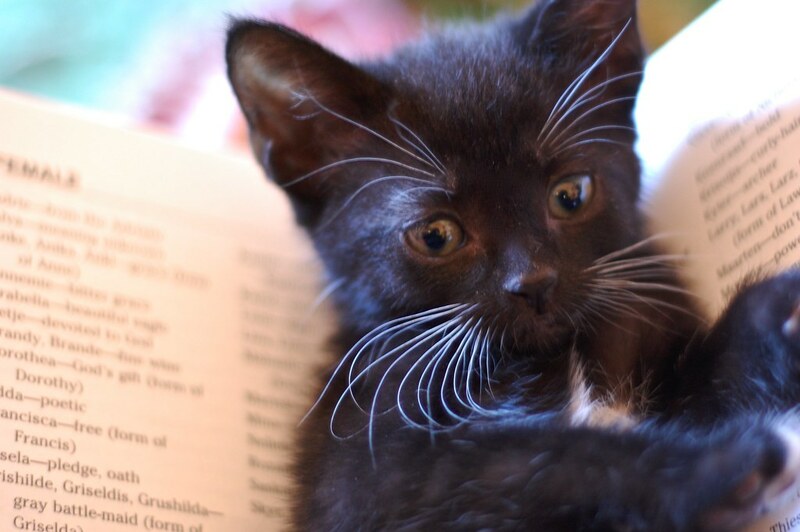 I need a kitten bookmark. oh my, whiskers and toeses of cute!!! Those are some serious whiskers! I want a book like that. Turn the page and WHAM....a kitty pops out! Can't wait to find out if there is yet another brown tabby/tuxedo combo! Is that a naming dictionary you're lying on, little angel? Have you picked out a name for yourself? :-D Welcome to the IBKC! And does that mean you're female, or that you have a baby sister?? I'm on the edge of my seat! Wait a minute!!! Did you swipe Sue's little Sally???? Oh my gosh! I almost squeed out loud when I saw this picture!!! Kittens: The Antidote to Mondays. I am excited to meet the new litter! Those whiskers make him/her look like an old-fashioned English gentleman - the only thing missing is a monocle! Ooooo. The black ones are always my favorites. I bet Charlene is sniffing at the kitten's door! From my side of the couch, "Squeeee!" From my husbands side of the couch, "Is it kittens? That sounds like a kitten squee." Look at those whiskers!!! OMG!!! I am so excited! How cute!!!!! Yay for kittens!!! So happy to see another crop of kittens!! I squeed! I think it's a girl!!! Goody! Babies! So early! Well, they are in good hands with you... Can't wait to see more! My, what big eyes you have, little one! Hello cutie! Can't wait to meet you and your friends! Is it just me, or does this little one look like Cornelius Bouvier might be a relative? THOSE WHISKERS! Wow - those are killer. Can't wait to meet the new little ones! BEST WHISKERS AWARD!!! Srius! Utterly adorable! I can go to bed content, knowing Luxurious Lil Whiskerbaby is safe & warm. So this is one of the babies Charlene was talking about! How precious!! Don't worry little one. YOU have no social pressure on you to tell us all your name. Just help Miss Laurie find one for you, she speaks kitten and has an awesome interpreter on staff, too! OOOOH! Please show us soon! Kitties!!! I can't wait to see them! A baby atop a book of names...these aging eyes could only make out Ida and Griselda....Griselda???????????????? this suspense is killing me! YAY!!!!! I am *so* excited!!! How Cute! Point me to the end of the nose kissing line. Wheeee! And clearly this one is a scholar, as well as being adorable! Can't wait to meet you and your sibs, sweetie! I just realized she's lying on a book of names! Hilarious - "Here, let me pick!" I am such a sucker for white whiskers and black fur. My tuxie-girl has that combo, and when she fluffs them out and gives me the melty-face, I'm a puddle of goo.